At 6'6", Jessie fits in the back of a Scion iQ. I love small cars. I'm also a tall man. How tall? Well, I'm 6'6", 225 lbs. 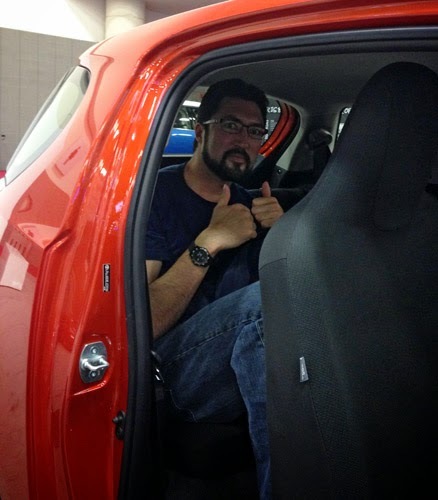 To get a good idea of how tall I am, here's a picture of me in the back seat of a Scion iQ. Now that you have come down from that feeling of shock and awe, you can imagine the challenge that I face whenever I'm trying to fit into a subcompact vehicle. Luckily, there are a few vehicles that I can wedge myself into, some better than others. Nissan Versa: basically the "limo" of small cars. More specifically, the rear-seat legroom is insane back there, besting all small cars, as well as a few bigger cars. Nissan did a great job of maximising the interior room in this car. As far as the fit and finish of, well...it was definitely done to a price point. Fortunately, that hasn't kept it from being a best seller. Chevy Sonic: this has the best seats of any subcompact that I've ever been in/driven, far and away. The seats even rival cars that are bigger, allowing for a generous amount of thigh support, something that is important when you have long legs. Also, it is quite roomy, with plenty of head, shoulder, hip, and legroom. It's a vast improvement overall from the outgoing Chevy Aveo, although the legroom in that car was quite impressive. I also happen to have a small place in my heart for the first-generation hatchback. Scion xD: I've never driven one of these, but I've been in the backseat of one, and like the Versa, the room back there rivals most bigger cars. Coupled with the smooth ride, I wouldn't mind being chauffeured around in one of them. Honda Fit: This, along with the Versa, does a great job of maximising the use of the interior. The "Magic Seats" are great if you need to move large objects, or if you're like me, your dog. Our Australian Shepherd (named Jade) loves to ride along with us, and lifting the seat up would give her a place to lay down ... whenever she's not trying to jump into our laps … while I'm driving. Hyundai Accent/Kia Rio: If it's legroom that you're looking for, your search is over. I'm not sure if Koreans have long legs (I'm half-Korean, and I do ... somewhat), but it seems to me that almost every Hyundai/Kia has an insane amount of legroom built into the front seats. Granted, I prefer to sit close to the front seat (think NASCAR), but yeah. My 2006 Kia Spectra EX (RIP) was great on this. Fiat 500: Another favorite that does a great job on the inside as well, along I found that I can't sit with my legs spread out (how I normally like to drive, especially when the cruise control is on). It, along with the Mini Cooper, has perhaps the most fashion-conscious interiors in their class. But like the upper-end Mazda2/Fiesta, it comes at a steep price. Scion iQ: As much as I dislike Toyota in general, I actually really dig this car. It's like they took the ForTwo (loved this since Merc and Swatch hooked up all those years ago), and improved on it in nearly every single way. Two of my car buddies both own one, which says a lot about two car guys shelling out their hard-earned cash on one (one also had a Fiat 500 Abarth). Heck, I can even fit in the back of one of them! Chevy Spark: This tiny four-door actually has decent room in the front and back. Although I can fit in it, after a while, it does start to feel a little cramped. I think that not having to row my own gears would free up a bit of room. Although the leg room is adequate, it is lacking a bit in the shoulder area, which is essential for moving your arms around (in order to turn the steering wheel). Smart Fortwo: Perhaps the smallest car for sale here (from a major automaker), I can easily fit into it. For some reason, the earlier models presented an issue with my right knee hitting the lower part of the dash, but the newer models don't seem to have that issue. Could be newer seats, or it's just in my head. No telling. Mazda2: One of my personal favorites, along with its corporate twin, the Ford Fiesta, also does a great job of maximizing the amount of room in its rather diminutive body. I felt rather comfortable in the driver's seat, with plenty of head, leg, and shoulder room to move around in (unlike a certain Chrysler Crossfire that I almost bought back in 2008). Unfortunately, all of that room comes at an expense of the lack of legroom in the back. Toyota Prius C: Although rarely mentioned with other subcompacts, due to its higher asking price, it is small. Really small. Like, the backseat of a 2000 Toyota 4Runner small. The Prius Liftback is small enough as it is, but the C is tiny. I could barely fit inside. Honda Insight: Still roomy-ish (is that even a word? ), but the hybrid system is atrocious, and doesn't make for a smooth drive. I wouldn't recommend either of these Honda hybrids. Toyota Yaris: There's plenty of shoulder and hip room, but it lacks head and legroom, especially the latter. Also, the lack of a telescopic wheel makes bad matters worse. 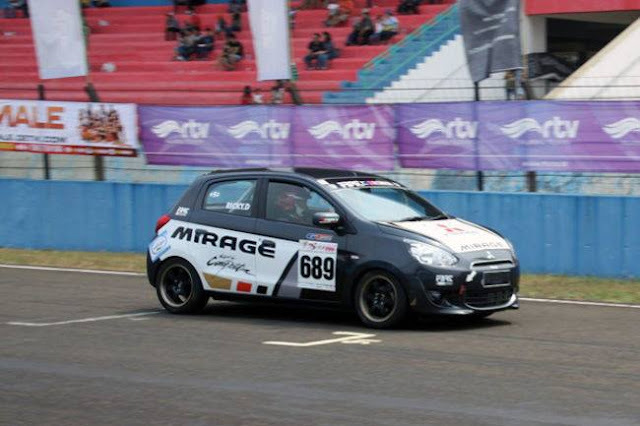 Mitsubishi Mirage: I was really intrigued with this car, as I felt like it was the shot-in-the arm that Mitsu so desperately needs. That is, until I drove it. I normally reserve the title of "worst new car sold today" for whatever GM or Dodge was selling, but this car is downright awful. Everything about it screams that this car is really overpriced, from the fit and finish, the "quality" of the materials, to the way that it drives. Handling goes from flimsy (city) to downright scary (on the highway). 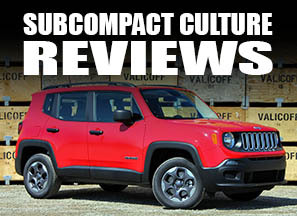 There's a great review on this car here, and for the most part, I completely agree with it. It makes more sense with a $9,995 MSRP on the Moroney, but alas, asking for the same amount of money as the best-sellers on this list is ambitious at best. Oh, the room inside ... yeah, it was quite roomy, actually (except for the lack of headroom). No Nissan Versa, mind you. The back seat wasn't bad either. THE "SO AWESOME THAT IT DESERVES ITS OWN CATEGORY"
Mazda Miata: That's right, I saved the best for last. As the roadster has increased in size, so has the level of comfort for me. With the current generation (NC chassis) of course, I can fit in it well, as well as the older NB. But the first-gen NA? Fuhgetaboutit. I actually got stuck in one at a car dealership once. I had to have my little brother come and pull me out. Same with the now-defunct Toyota MR2 Spyder, although I barely managed to get out alive. That's my somewhat-scientific list of subcompacts that I can fit into. If and when I do decide to get one, I'll actually be downsizing from my current daily driver, a 2007 Honda Civic LX Coupe.